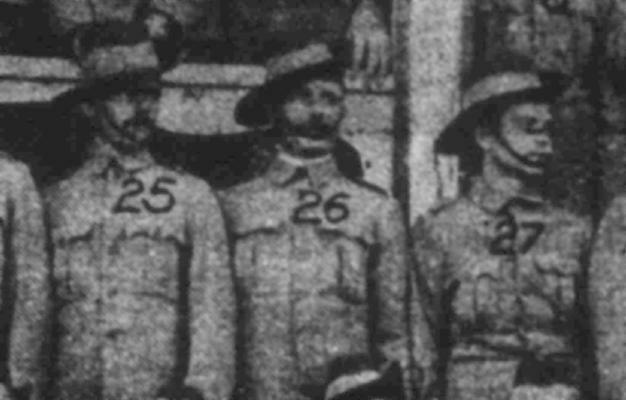 Officers of the 3rd NSW Mounted Rifles, March 1901. Murray, P. L., Official Records of the Australian Military Contingents to the War in South Africa, pp. 123 - 124. Third New South Wales Mounted Rifles. This Regiment was raised upon the same lines as its predecessors, preference being given to trained men who were good shots and good riders; age, 20 to 40 years; height, 6 feet 6 inches and upwards; minimum chest measurement, 34 inches. Applicants were required to be single men and to pass a military medical examination. Establishment and rates of pay as for 2nd Mounted Rifles. Uniform consisted of F.S. jacket, pants, puttees, and hat. Equipped with saddles (portion only). 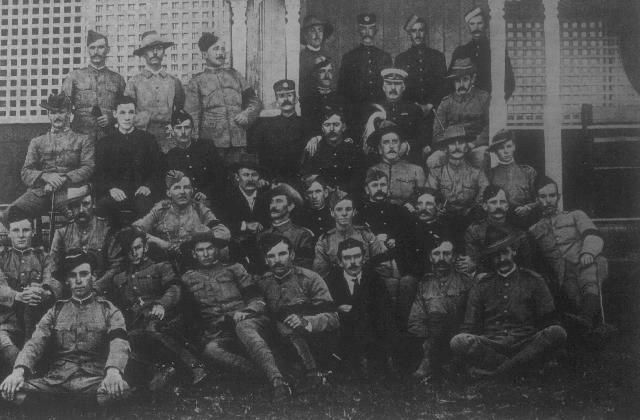 "B" and "D" squadrons of this regiment embarked at Sydney on the transport Maplemore on the 16th March, and arrived at Port Elizabeth on 12th April, 1901, with 8 officers and 251 others. 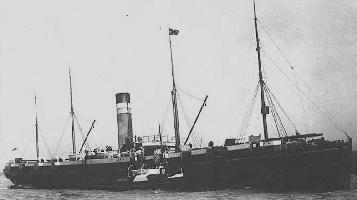 "A," "C;" and "E" squadrons, with Regimental Staff, embarked on transport British Princess on 21st March, and arrived at Durban on 17th April, 1901, with 17 officers and 401 other ranks. 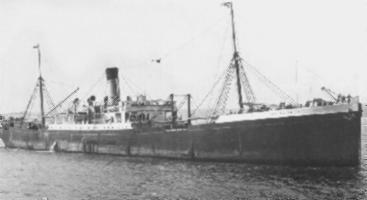 SS Ranee departing Sydney, 21 March 1901. Machine-gun section embarked on transport Ranee on 21st March, and arrived at Durban on 23rd April, 1901. Strength, 2 officers, 34 others. Drafts embarked on transport Antillian on 5th April, and arrived at Durban on 12th May, 1901 - 10 officers, 294 others. Total strength of regiment, 37 officers, 980 of other ranks, besides supernumeraries with 1,000 horses. One officer, 36 Sergeants and rank and file were killed or died; and 6 officers, 48 others were struck off in South Africa. The regiment embarked at Cape Town for Australia on 4th May, and arrived at Sydney on 3rd June, 1902, calling at Albany, Adelaide, and Melbourne en route. This regiment was attached to Colonel Remington's column from 2nd May, 1901, to 28th April, 1902. The regiment took part in operations in the Eastern Transvaal and Eastern Orange River Colony in 1901-2. It also took part in several drives in the early part of 1902; the principal one, the Harrismith drive, resulting in the capture of 231 prisoners, 26,000 head of cattle, and 2,000 horses. A Machine-gun section was attached to it, vide Nominal Roll. Murray, P. L., Official Records of the Australian Military Contingents to the War in South Africa, pp. 125 - 143. 2070 Trooper John Francis Henry ADAMS. 1164 Quartermaster Sergeant John James ADRIEN. 1261 Trooper William John ALEXANDER. 1606 Trooper Francis Frederick ALLEN. Second Lieutenant Ralph Rowland ALLEN. 1790 Trooper Reginald Ralph ALLEY. 1537 Trooper Alfred John ALLINGHAM. 3007 Trooper John Worthington ALLINGHAM. 1700 Trooper Charles Walter ALLISON. 3020 Lance Corporal Edgar Walter AMOR. 3682 Trooper Douglas James AMOS. 2948 Trooper Charles Alexander ANDERSON. 2954 Trooper John Edward ANDERSON. 3718 Trooper Walter Charles ANDERSON. 1926 Trooper Arthur Edgar ANDREWS. 1592 Trooper Henry George William ANGEL. 1937 Trooper William Paul ANGOVE. 2813 Sergeant Elwyn D ANTILL. 1471 Trooper Ernest Albert APPLEBY. 1936 Trooper Aubrey Vincent APTHORPE. 3317 Trooper George Henry ARMFIELD. 1340 Trooper John Frederick ARMSTRONG. 1141 Trooper William Alec. ARMSTRONG. 1512 Trooper Thomas John ARNEIL. 2362 Corporal Herman Augustus ARNOLD. 1603 Trooper James Richard ASHTON. 3140 Farrier Alfred Joseph ATHERTON. 1753 Trooper Walter John ATKINSON. 3293 Lance Corporal Arthur BAKER. 2754 Corporal Charles Henry BANKS. 1645 Sergeant Alfred Henry BARNES. 1909 Trooper Robert Edward BARSLEY. 1940 Trooper Frederick Charles BATES. 2060 Trooper James Valentine BATSON. 1922 Trooper Samuel Lyson BAXTER. 3270 Trooper George Walter BAYLISS. 2086 Trooper Harry Monsell BAYLISS. 1236 Trooper Hume Phillip BECKHOUSE. 2658 Trooper Wentworth L BELL. 1687 Trooper Charles Arthur BENTLEY. 2137 Trooper John Arthur BERRIMAN. 2135 Trooper William Thomas BERRIMAN. 1155 Trooper Samuel Magor BERRY. 1045 Quartermaster Sergeant William Ronald Stuart BERRY. 1744 Farrier Sergeant John Ernest Edward BILLET. 1144 Trooper William Edward BING. Second Lieutenant John William BINSTEAD. 3720 Trooper Kingsley Charles BIRCHALL. 1150 Trooper Henry Alexander BLACK. 2203 Sergeant Major John BLACK. 1455 Squadron Sergeant Major William Henderson BLACK. 2520 Gunner Sydney Frederick Joseph BLAKE. 3278 Trooper William John BOARDMAN. 2681 Trooper William James BONHAM. 2470 Gunner Charles Edward BOOKER. 1046 Trooper William Alfred Sydney BOOT. 3472 Trooper John King BORELAND. 2009 Trooper John Martin BOSLER. 2291 Trooper Joseph Pierce BOULAIS. 3605 Trooper John Ernest Pushman BOWERNING. 3486 Trooper Edgar Reginald BOYD. 2359 Trooper Trevelyn Lyons BRACKENRIGG. 3259 Orderly Room Clerk Phillip Patrick BRADY. 2098 Trooper Joseph Orton BRAGGS. 2708 Sergeant Trumpeter William Angelo BREES. 2180 Trooper John Thomas BRENNAN. 3550 Trooper Frank Albert BRIEN. 1590 Lance Corporal John Augustus BRIMS. 1877 Trooper John Francis BRODERICK. 1120 Sergeant Alexander Neil BRODIE. 1429 Trooper John Alexander BRODIE. 3046 Trooper William Walter BRODIE. Second Lieutenant Herbert Edward BROOKE. 1575 Trooper Samuel George BROOKER. 1083 Trooper Thomas Henry BROOKS. 2672 Trooper William George BROOMHAM. 1802 Trooper Arthur Matthew BROPHY. 3577 Trooper Albert Jordan BROWN. 1918 Trooper Henry Austin BROWN. 1919 Trooper George Charles BROWNE. 2241 Gunner Henry Frederick BROWNE. 1102 Trooper Robert James BROWNE. 3674 Regimental Quartermaster Sergeant Stephen BRUGGY. 1663 Trooper Alfred Joshua BUDD. 2747 Trooper Charles Mathews BUDGEN. Second Lieutenant Charles Cyrus BULLOCK. 1954 Sergeant Thomas Persehouse BURGIS. 2979 Trooper George Walter BURROWS. 3367 Trooper Edgar William BUSH. 1059 Shoeing Smith Albert Henry BUTCHER. 1114 Trooper James Richard BUTLER. 3341 Sergeant Henry James Francis BUTWELL. 1279 Trooper Frank Patrick BYRNE. 1219 Trooper Robert Walter Herbert BYRON. 3276 Trooper James Valentine CABAN. 1594 Trooper Ernest Arthur CADDOW. 1666 Trooper Norman Victor CAMERON. 1834 Trooper Thomas John CAMERON. 1702 Trooper Andrew McKenzie CAMPBELL. 3704 Trooper Ernest Edgar CAPNER. 1716 Trooper William Thomas CAPPER. 2101 Trooper Sydney Edward CARBINE. 3073 Trooper Walter Francis CARDWELL. 2822 Trumpeter David Joseph CARMICHAEL. 2172 Trooper Stanley Leslie CARPENTER. 2018 Trooper William John CARROLL. 1153 Trooper Arthur GP CARTER. 2843 Trooper Frank Anderson CARTER. 2190 Trooper John Herbert CASEY. 2939 Trooper William Henry Bright CATES. 2870 Trooper David Oliver CHADWICK. 2746 Trooper James Richard CHAMBERS. 1208 Trooper John George CHEETHAM. 2437 Driver Alexander John Henry CHISHOLM. 2438 Driver Thomas John CHISHOLM. 1581 Trooper Michael Farrell CLAFFEY. 3034 Trooper John Patrick CLANCY. 3008 Trooper Michael Vincent Bond CLANCY. 345 Sergeant William Everard CLARE. 3281 Trooper Frederick Henry CLARK. 3469 Sergeant George Henry James CLARK. 1196 Shoeing Smith John CLARK. 2626 Trooper Edwin James CLARKE. 2865 Trooper James Stephens CLARKE. 2127 Trooper John James CLARKE. 2607 Trooper William Francis CLARKE. 2554 Trooper Charles Clifford CLAYTON. 3150 Trooper George Valentine CLEARY. 2316 Trooper Henry Edward CLEMENTS. 2824 Trooper James Lionel CLEMENTS. 2325 Shoeing Smith Charles CLIFFORD. 2432 Driver William Frederick CLUTTON. 1218 Trooper James Cornelius COADY. 1520 Lance Corporal George Donald COATES. 2121 Trooper Robert Parmenas COLEMAN. 1248 Trooper Edward Thomas COLLINS. 3115 Trooper William Henry COLLINS. 2932 Trooper Charles William CONE. 2266 Trooper William Lockwood COOPER. 1445 Corporal Arthur Ernest Cody COULTER. 1131 Trooper Norbert Francis COVENEY. 2160 Trooper Joseph Ashton COWHAM. 1230 Trooper Carl Mackenzie COX. 2091 Trooper Alexander Henry CRAGO. 3690 Trooper Henry Ernest CRANE. 2799 Trooper Augustine Joseph CRANNEY. 1430 Trooper George Martin CRONIN. 2997 Trooper Joseph Blackstone CROUCH. 1258 Trooper Alfred Edward CUFLEY. 1642 Trooper Richard Mathew CULSHAW. 1066 Trooper Roland Earl DALEY. 2871 Trooper James Hayes DANDO. Second Lieutenant George Anderson DART. 1976 Trooper Douglas Gordon DAVIDSON. 3700 Trooper Arthur Irwin DAVIES. 1359 Trooper Charles Austin DAVIS. 2793 Lance Corporal George Frederick DAVIS. 3003 Trooper Robert Edward DAVIS. 2918 Trooper Thomas Charles DAVIS. 2815 Trooper Thomas Theodore DAVIS. 1969 Shoeing Smith Patrick Silvester DEAN. 1573 Driver Morgan Robert Fitzmaurice DEANE. 2758 Trooper Walter Henry DEIN. 2019 Corporal Charles Edwin DENT. 49 Corporal George Jennings DICKSON. 3413 Trooper Arthur Edward DIX. 2250 Trooper Edward Ernest DOBBIE. 3346 Trooper Patrick Joseph DOHERTY. 2017 Trooper Edward Douglas DONEHUE. 1938 Shoeing Smith Joseph DONN. 2357 Trooper James Thomas DONNELLY. 1513 Trooper Albert Alousius DONNOLLY. 1090 Trooper James Edward DOUGLASS. 2175 Trooper William Joseph DOWDELL. 1735 Trooper Edward Thomas DOWLING. 1729 Trooper James Sterling DOWNES. 1501 Shoeing Smith Andrew Edwin DOYLE. 2014 Corporal Edgar Septimus DRANSFIELD. 1818 Trooper Reginald Gustavus DRANSFIELD. 3265 Trooper Robert Samuel DRYBURGH. 916 Trooper Sidney William DUKE. 2312 Trooper John James DUNN. 1461 Trooper Stanley Arthur DWYER. 3526 Lance Corporal William Herbert EASTERBROOK. 1708 Trooper Joseph Henry EDGAR. 3524 Trooper Arthur Robert EDWARDS. 3332 Trooper Edwin Robert ELLIOTT. 2744 Trooper Leslie Herbert Daniel ELLIOTT. 2770 Trooper William Charles ELLIS. 1628 Trooper John Edmond ELLWOOD. 1631 Corporal Thomas Frederick ELLWOOD. 1754 Trooper John Frederick EVANS. 3272 Trooper John William EVERETT. 1600 Trooper Herbert Alfred FARR. 3466 Trooper Wellington Thomas FAULKNER. 3185 Trumpeter William James FITTON. 2541 Driver Martin Henry FITZGERALD. 1946 Trooper Patrick Michael FITZHENRY. 928 Shoeing Smith Landen Edgar FORRESTER. 2069 Trooper Horace Saker FOULKES. 1608 Trooper James George FOWLER. 1244 Trooper Thomas Patrick FOX. 2974 Trooper Edward Frederick FRANCIS. 1690 Trooper George Cuthbert FRANCIS. 1957 Trooper Walter George FRAZER. 3359 Trooper Edwin Henry FRYER. 1077 Trooper Charles John FULLER. 3062 Trooper William Walter FULLER. 1557 Lance Corporal John Edward GALLAGHER. 1570 Trooper John William GALLAGHER. 3398 Trooper George Henry GAMBLE. 3719 Trooper Norman Leslie GARDNER. 2485 Trooper Richard Milton GARRARD. 1625 Shoeing Smith Charles Arthur GARRETTY. 2367 Trooper John Hill GARVEN. 1217 Lance Corporal Sydney GEORGE. 1874 Trooper Adam Murray GIBB. 1531 Trooper Thomas Henry GIBSON. 1867 Trooper William Henry GILBERT. 2257 Trooper Henry James GILLIARD. 1198 Trooper Ambrose Gregory GILLIGAN. 3342 Trooper Herbert Anthony GLEN. 2469 Gunner William Ralph GLOVER. 1373 Trooper Arthur Davis GODBER. 1232 Trooper Norman William GOODE. 3541 Trooper William Norman GOODE. 2134 Sergeant Alec. Gilligar GORDON. 1328 Quartermaster Sergeant Robert Charles GORDON. 2589 Lance Corporal Wilfred GORDON. 2504 Trooper Alfred Patrick GORMLEY. 52 Trooper Charles John GOSPER. 3464 Trooper Frederick William GOSPER. 2147 Trooper George Ethelbert GRAHAM. 1629 Trooper William Abell GRAHAM. 2074 Trooper William Francis GRANT. 3228 Corporal James Mackey GRAY. 3266 Trooper George Henry GREEN. 1514 Trooper Henry Burnet GREEN. Second Lieutenant George Malcolm GREENWELL. 1197 Trooper Percy Hobart GREGORY. 1253 Lance Corporal Benjamin Martin GRIBBLE. 2862 Trooper Albert Edward Murhall GRIFFITH. 947 Trooper Frederick Albert GRINSTEAD. 3389 Trooper William Charles GRUMBLETON. 2283 Trooper William John HALL. 1367 Trooper David Alexander HAMILTON. 2106 Sergeant Francis Benjamin HAMILTON. 2297 Shoeing Smith Alexander Henry HAMMOND. 3081 Trooper William John HARGREAVES. 2111 Trooper Charles Ernest HARPER. 1699 Trooper Charles William HARRIS. 1497 Trooper William John HARRIS. 3593 Sergeant Major Ernest Watkins HART. 17 Trooper William John HART. 2411 Gunner Arthur Edward HATTERSLEY. 1840 Trooper William Robert HAWES. 2123 Trooper James Henry HAYES. 1228 Trooper Norman Richard HAYES. 1784 Trooper Percy Thomas HAYES. 1908 Trooper William Boyne HAYMAN. 2519 Trumpeter Frederick James HEAPY. 2210 Quartermaster Sergeant Thomas Joseph HEERY. 817 Trooper Claude Frederick Henry Russel HEINE. 1451 Trooper Godfrey Davanant HEUCHMAN. 3303 Trooper George Thomas HEYDON. 338 Trooper Sydney Charles HEYMOURE. 2274 Trooper Frederick Harold HIGGINS. 2797 Trooper Alexander James HILL. 2505 Trooper William Henry HILL. 2402 Trooper Herbert Edward HINES. 3639 Trumpeter Frank Foley HOBSON. 2088 Trooper Albert Charles HOCKINGS. 782 Corporal Herbert Ernest HODGES. 157 Trooper Charles Christopher HODGSON. 1974 Trooper Harold Hepworth HODGSON. 1379 Trooper Samuel George HODGSON. 1358 Sergeant John George HODSON. 1767 Trooper Albert Everard HOFFMAN. Second Lieutenant Frederick Henry HOLLAND. 1415 Trooper Cyril James HOLSWICK. 2302 Trooper Donald Lea HOLT. 1286 Farrier Sergeant Ernest Fairhall HOPKINSON. 2460 Corporal Victor Burchall HOPKINSON. 1486 Trooper Richard Johnson HORNBY. 3308 Lance Corporal Ernest Francis HORSLEY. 1036 Trooper Sydney James HORTON. 1242 Trooper Alan Aubrey HOWARD. 1895 Trooper Edgar Vincent HOWARD. 1126 Trooper John Edward HUFF. 1111 Trooper Aubrey William HUGGINS. 728 Shoeing Smith Edgar Idem HUGGINS. 2454 Trooper George Hugh HUGHES. 1691 Trooper Hugh Llewellyn HUGHES. 2079 Trooper John James HUGHES. 2567 Trooper William Robert HULKS. 2924 Trooper Walter Vincent Victor HUMPHRIES. 1018 Trooper James William ILLSLEY. 1256 Corporal Edward Rogers ISAACS. 2119 Trooper Robert Crighton ISBISTER. 1234 Trooper William Charles JACKSON. 1252 Trooper James Henry JACOBS. 1508 Trooper William John JEFFREY. 1020 Trooper Charles Edwin JENNINGS. 1981 Corporal Alfred William JOHNSON. 3118 Corporal David Charles JOHNSON. 1413 Lance Corporal Eugene Vigil JOHNSON. 3298 Trooper William Reuben JOHNSON. 3091 Trooper Christopher Robert JOHNSTON. 1329 Trooper William Joseph JOHNSTON. 1463 Trooper Albert Henry JONES. 2892 Trooper Alfred Richard JONES. 2218 Trooper Edwin Walter JONES. 2278 Trooper Gustavus Travers JONES. 2153 Trooper Herbert Ernest JONES. 2763 Corporal Hugh Trevor JONES. 1894 Trooper John Jonathan JONES. 3299 Trooper Albert John JOYCE. 2103 Trooper Reginald Milton JOYCE. 1794 Trooper George Charles KAIN. 3274 Trooper Searle Francis KAY. 1276 Trooper Patrick John KEADY. 3186 Corporal Charles Richard KELAHER. 2208 Trooper Joseph Augustine KELLY. 2895 Trooper Hugh William KEMP. 2257 Trooper Edgar Aloysius KENNA. 2765 Trooper Arthur Andrew KERR. 2138 Trooper George Findon KERTON. 2081 Trooper Herbert Alonzo KEYS. 2254 Trooper William Giles KIDSON. 1634 Trooper James Alexander KILPATRICK. 1676 Corporal Alfred Ernest KIMMORLEY. 1496 Trooper John Thomas KING. 2201 Trooper Stanley Horace KINGSMILL. 2183 Trooper William Joseph KINSELA. 1990 Trooper George Amos KIRBY. 3273 Trooper Alfred Thomas KNIGHT. 2857 Trooper Charles Goswell KNIGHT. 3162 Lance Corporal William KUCHLER. 1307 Trooper Henry Herbert LANE. 1832 Trooper Henry Joseph LANE. 1758 Trooper Henry Walter LANE. 2782 Trooper James Augustus LANE. 2511 Trooper William John LANGRISH. 1193 Trooper Albert Victor LARDEN. 2446 Lance Corporal Charles William LAWRENCE. 1390 Trooper Leslie Joseph LE SEUR. 484 Corporal Thomas James LEES. 1270 Trooper Joseph Edward LEFOE. 1595 Trooper Herbert William LENON. 3055 Trooper Thomas Arthur LESSLIE. 1787 Trooper Septimus George LETT. 3717 Trooper Albert Ernest LEWIS. 3126 Trooper John William Nelson LEWIS. 2169 Trooper William Herbert LEWIS. 1899 Trooper Wallace George LEY. 3411 Trooper Charles Edward LITHGO. 2971 Trooper Henry James LITTLEY. 3019 Trooper Charles James LLOYD. 3068 Trooper Herbert Brisbane LLOYD. 1626 Trooper Arthur Charles LOADER. 2094 Trooper Charles Lionel LOCKE. 1875 Sergeant George Hugh LOCKETT. 2376 Trooper Ernest Charles LOGAN. 1511 Trooper Herbert P LOVETT. 1869 Trooper Joseph Alphonsus LUCEY. 1132 Lance Corporal George Darlow LUPTON. 1402 Trooper Alfred Rudolph LYON. 128 Trooper William James LYONS. 1633 Trooper Alexander John MACDONALD. 2776 Trooper Hugh Fraser MACKENZIE. 3096 Trooper John Thomas Evendon MACKENZIE. 1688 Trooper James Peter MAHER. 2775 Lance Corporal Alfred Aristides MANUSA. 2804 Trooper James Gregory MARSHALL. 1914 Trooper Charles Gilbert MARTIN. 2756 Trooper Thomas Henry Alexander MARTIN. 2066 Corporal Daniel James MASON. 3315 Corporal James P MATTHEWS. 1886 Trumpeter Percy Clarke MATTHEWS. 1278 Trooper William John MATTHEWS. 2587 Corporal William Morley MAXWELL. 3056 Trooper Thomas Romanus Patricia MCALLISTER. 1420 Trooper George Rodney MCALPINE. 2136 Trooper George Kirby MCARTHUR. 2875 Trooper Norman Hunt MCCLUNG. 1246 Corporal Thomas William Wallace MCCLURG. 1959 Trooper Donald Norman MCCLYMONT. 3671 Regimental Sergeant Major John Thomas MCCOLL. 2128 Trooper John George MCCOOK. 1994 Trooper John Alexander MCCROSSIN. 3373 Trooper William Duncan MCDERMID. 836 Trooper Leslie William Hugh MCDERMOTT. 3005 Trooper Donald Angus MCDIARMID. 2686 Trooper George Alfred MCDONNELL. 1354 Trooper Charles Hugh MCINNES. 3037 Trooper Alexander Donald MCINTYRE. 2000 Trooper Charles William MCINTYRE. 2888 Trooper Bernard Francis MCIVOR. 1439 Trooper Samuel Francis MCKENZIE. 3710 Trooper William Henry MCLACHLAN. 2182 Trooper Mortimer Patrick MCMAHON. 1630 Shoeing Smith Terance Charles MCMAHON. 2936 Trooper Thomas James MCMAHON. 2016 Corporal Thomas Joseph MCMAHON. 1586 Sergeant Edward James MCNABB. 1160 Trooper Bernard Francis MCNAMARA. 3696 Farrier Sergeant Kenneth Ross MCPHERSON. 1460 Lance Corporal William MCSHANE. 1860 Trooper Herbert Ernest MEAD. 1906 Corporal Herbert Joseph MEECHAM. 1061 Corporal Reginald Pentland MEEHAM. 2942 Trooper Thomas Frederick MEREDITH. 2130 Sergeant John William MILLER. 2588 Trooper George Absalom MITCHELL. 1560 Trooper Stanley Oswald MITCHELL. 1540 Trooper George Edward Cyril MOBBERLY. 2524 Trooper Charles Herbert MOORE. 2165 Trooper Frederick George MOORE. 2399 Trumpeter Frederick John MOORE. 3651 Squadron Sergeant Major James William MOORE. 784 Corporal William Archibald MOORE. 1285 Trooper Joseph Brabazon Cavendish MORRIS. 3422 Trooper James Reginald MORTON. 3188 Trooper William George MOULD. 3054 Trooper Albert Henry MUNTZ. 1509 Trooper Oliver Charles MURPHY. 1341 Trooper Hugh Miller MURRAY. 1677 Trooper Alexander Patrick MURTAGH. 3722 Lance Corporal Thomas Thomson MUSGRAVE. 3088 Trooper William Henry NASH. 1190 Corporal Vernour Vigne NATHAN. 1843 Trooper Thomas William NEALE. 3240 Trooper John Francis NEARY. 3381 Farrier Sergeant John Francis Patrick NEENAN. 1661 Trooper Ernest Edwin NEILL. 2089 Trooper William Wallace NELSON. 3030 Trooper Edward Joseph NICHOLS. 3117 Corporal Frederick George NICHOLS. 2213 Trooper Walter Herbert NICHOLSON. 595 Corporal Horace PC NIXON. 2110 Trooper William Arthur NOAKES. 2276 Sqn.Sgt.maj. George William NORMAN. 3560 Trooper Arthur George NORRIS. 2264 Trooper William John NORWOOD. 101 Corporal Robert Anthony NOSSITER. 1624 Sergeant Archibald Frederick NOWLAND. 3024 Trooper Benjamin Henry OBORN. 1091 Trooper Michael Thomas O'DONNELL. 2118 Trooper William Ernest OGILVIE. 2063 Trooper John Ernest O'KEEFE. 2061 Trooper Albert Richard OLIVE. 944 Shoeing Smith Martin O'NEIL. 3631 Trooper Hilton Thomas PARKER. 1714 Trooper Frederick William PARKINSON. 1556 Trooper Samuel Herhert PARR. 2731 Trooper Lewis Cornelius PARRISH. 2745 Trooper Stephen Thomas PATEMAN. 2182 Trooper Douglas Fawcett PATISON. 1364 Trooper Arthur Charles PATTON. 2940 Trooper William Edward PECK. 2378 Driver John James PEDERSON. 2236 Trooper Charles Maxian PENNY. 1991 Trooper William Henry PENNY. 2205 Trooper Benjamin George PERRIN. 2439 Driver Ernest Alfred PHILP. 3340 Trooper William Henry PIGGOTT. 891 Gunner Oswald Saunders PITT. 1583 Trooper Herbert Leslie PLEYDELL. 2401 Trooper Edgar Ewart PLUCKNETT. 2385 Trooper Frederick Charles PLUMMER. 1893 Trooper Arthur James PORTER. 1781 Trooper Thomas H lton POWELL. 2198 Trooper Edgar Gerald PRETTY. Second Lieutenant David CW Howell PRICE. 2983 Sergeant Albert Henry PROBERT. 1298 Trooper George Henry PRUSSIAN. 1887 Trumpeter Walter Charles PUGH. 2981 Trooper Phillip Alexander QUETCHER. 2967 Lance Corporal William Edward RANKIN. 1084 Trooper Herbert George RAY. 1039 Trooper Walter Thomas RAY. 1381 Trooper Thomas Rolls READ. 1458 Corporal John James REARDON. 1529 Trooper Duncan Robert REID. 2090 Trooper Robert Harris RICHARDS. 2322 Trooper George Henry Archibald RICHARDSON. 1475 Corporal James Fraser RICHARDSON. 1454 Trooper James Samuel ROACH. 1161 Trooper Nicol H RODGERS. 2253 Trooper Oliver John ROGERS. 903 Trooper Thomas Bray ROGERS. 2448 Lance Corporal Charles ROSTEN. 3669 Trooper William Henry ROWLAND. 1099 Trooper Robert James ROY. 2241 Trooper Charles Orr RUSH. 1472 Trooper Frederick Winter RUSSELL. 926 Trooper Henry Patrick RYAN. 1347 Corporal James Alfred RYAN. 1597 Trooper John Henry RYAN. 1297 Trooper Walter John RYAN. 2166 Trooper Frank Francis SALES. 3064 Trooper Albert Alexander SAVAGE. 1826 Trooper Jasper James SEARD. 3138 Lance Corporal William Mervyn SEDGWICK. 1516 Trooper George Robert SEYMOUR. 2617 Trooper William Christopher SEYMOUR. 3699 Corporal Ernest Herbert SHANNON. Second Lieutenant Lindsay John SHAW. 2868 Trooper Cecil Woodford SHEARMAN. 2328 Trooper Albert Edward SHEARSTON. 3313 Trooper William Arthur SHEFFIELD. 3063 Sergeant William Henry SHEPHERD. 1707 Trooper Joseph George SHERRINGHAM. 1998 Trooper Frederick Taylor SIMEON. 3031 Corporal John Thomas SIMMONS. 1896 Trooper Edgar Whetter SIMPSON. 2273 Trooper George Achison SIMPSON. 1312 Trooper Samuel William SKINNER. 2786 Trooper Alfred Edgar SMITH. 2058 Corporal Cecil Selwyn SMITH. 816 Corporal David Owen Leslie SMITH. 2581 Farrier Donald Sidney SMITH. 1683 Trooper George William SMITH. 2894 Trooper George William SMITH. 3218 Sergeant Lennox Walter Macquarie SMITH. 1383 Saddler Matthew George SMITH. 2177 Trooper Pierce Seall SMITH. 264 Sergeant Sydney James SMITH. 2989 Trooper William Frank SMITH. 2629 Trooper William James SMITH. 2891 Trooper William Oscar SMITH. 1399 Trooper William Samuel SMITH. 2009 Trooper David George SMYTHE. 3027 Corporal Robert William SPURWAY. 3302 Trooper Archibald Sidney STACEY. 2796 Trooper Herbert Edwin STAFFORD. 1751 Trooper Frank Alfred STANNARD. 537 Trooper John Patrick STAPLETON. 1738 Quartermaster Sergeant John Baston STAUNTON. 1326 Trooper Alfred Mansfield STEAD. 1757 Trooper Albert George STERRITT. 1148 Trooper Bertram Alfred STEVENS. 1239 Corporal Edwin Marcus STEVENS. 2576 Trooper Raymond Douglas STEVENS. 3311 Trooper Harry John STEVENSON. 1614 Trooper Ewan Gore STEWART. 2919 Corporal Hugh Hill STEWART. 775 Trooper Samuel George STITT. 2231 Trooper Samuel John STONEHAM. 2748 Lance Corporal William STRACHAN. 2998 Trooper William Henry STRATTON. 3279 Trooper Albert Edward STRAUSS. 1113 Trooper Norman Hylton STRICKLAND. 1519 Trooper Charles Gordon Grant STUART. 1533 Trooper William James STUBBINGS. 2958 Trooper Clement Joseph STYNES. 1521 Trooper Leonard Oinan SULLINGS. 3086 Trooper Ernest Alfred SUMMERFIELD. 1810 Farrier Sergeant Donald SUTHERLAND. 569 Corporal James Duncan SUTTON. 3017 Trooper Charles James SWAN. Lieutenant Vet Stanley Leplastrier SYMONDS. 406 Trooper George Richard TAPLIN. 1789 Sergeant Albert Bentley TAYLOR. 987 Shoeing Smith Ernest Alexander TAYLOR. 1011 Trooper Frank Harold TAYLOR. 2381 Sergeant Murray Joseph TAYLOR. 3094 Sergeant Owen Albert TAYLOR. 1566 Corporal Arthur Samuel THOMAS. 3079 Lance Corporal William Edward THOMAS. 984 Trooper Harry Miller THOMPSON. 2277 Trooper James William THOMPSON. Lieutenant John Alfred Malbon Windeyer THOMPSON. 3285 Trooper Arthur Clarence THOMSON. 2239 Trooper Daniel Watson THOMSON. 3349 Trooper Bernard Vincent TIER. 2771 Trooper Clarence Edward TINDALL. 2711 Corporal Thomas James TIPPER. 2625 Corporal George Charles TOOGOOD. 988 Trooper Thomas Edward TOWNSEND. Lieutenant Graham Voller Dalhousie TREATT. 1371 Trooper Stacy Beauchamp TREWEEK. 3103 Trooper Albert Ernest TRINDER. 2718 Trooper Harry Reginald TROLLOPE. 1094 Trooper James Peter TUBBERTY. 1336 Trooper Arthur Leopold TUBNOR. 3275 Trooper Herbert Lionel TUDDENHAM. 2766 Trooper Charles Thomas Elisha TURNER. 2013 Trooper Frederick Thomas TURNER. 1582 Trooper Henry Ernest TURNER. 3286 Trooper Septimus Richard UNDERWOOD. 1892 Trooper Frederick Ernest URQUHART. 108 Trooper Arthur Henry Charles WAINE. 1804 Trooper Edward William WALKER. 3109 Trooper John William WALKER. 2987 Trooper Charles John WALKLING. 1408 Trooper George Henry WALL. 2178 Trooper Charles John WALLACE. 1792 Trooper William Richard WALLACE. 1295 Trooper Arthur Patrick WALSH. 1452 Sergeant John Edmund WALSH. 1755 Trooper Bert Thomas WARD. 2005 Trooper Edward Chorley WATT. 3544 Trooper Arthur Ernest WEBB. 2872 Trooper Edward Henry WELLS. 3153 Sergeant George Taylor WELLS. 1272 Trooper Charles Henry WEST. 2834 Trooper William Charles WESTON. 3051 Trooper William Thomas WETHERALL. 1571 Shoeing Smith Joseph William WHITBREAD. 2068 Trooper Edward Charles WHITE. 2140 Trooper Roland George WHITEHEAD. 3582 Trooper James Henry WHITFORD. 3041 Trooper James John WHYN. 3078 Trooper John William WICKHAM. 1900 Trooper Harold John WILKES. 107 Trooper Alexander Joseph WILLIAMS. 3716 Quartermaster Sergeant Henry WILLIAMS. 2649 Trooper James Bennett WILLIAMS. 1658 Gunner John Heitman WILLIAMS. 2141 Trooper Joseph Robert WILLIAMS. 2252 Trooper Walter Henry Burns WILLIAMS. 1544 Trooper Percy Claude WILLIAMSON. 2067 Trooper Fulton Barvelle Hooper WILLMETTE. 2457 Driver Alfred Ernest WILSON. 1527 Trooper Charles Brinsley WILSON. 1638 Corporal Edgar A WILSON. 2092 Trooper Robert Percy WILSON. 2427 Farrier Sergeant Albert Monday WONSON. 1925 Trooper Thomas Henry WOOD. 2911 Trooper Herbert Stanley WOODHILL. 2878 Trooper Fred Hewlett WOODWARD. 1500 Trooper William Henry WOOLLETT. 1910 Trumpeter Sydney Herbert WORTHINGTON. 2012 Trooper Edward Sidney YARD. 1142 Trooper Stanley Australia YARROW. The Roll of Honour contains the names of all the men known to have served at one time with the 3rd New South Wales Mounted Rifles and gave their lives in service of Australia, whether as part of the 3rd New South Wales Mounted Rifles or another unit during the Boer War. Sergeant AE Coulter and Private B Pipeding, NSW Mounted Infantry, were slightly wounded at Uikomet. 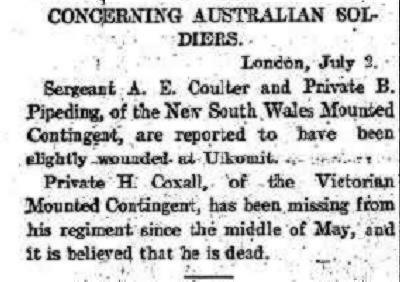 Sergeant A. E. Coulter and Private B. Pipeding, of the New South Wales Mounted Contingent, are reported to have been slightly wounded at Uikomit. 3rd NS Wales MI - 1455 Sgt AE Coulter, 1498 Pte B Pickering, slightly wounded, Uitkomst, June 20. A comparison of all the reports highlights the problem of understanding the event that actually occurred. Coulter was wounded. That is the theme of all the notifications. The list includes other Australian newspapers although the extracts are not above. The results are tabulated below. With the diversity of information, it was difficult for the reader of this news to know if the received information was accurate. Each report had elements that were correct but all provided incorrect information about this particular event. The surprising issue is that there was only one telegrapher in South Africa issuing the specific information. It is amazing how this information has varied according to the source receiving the information. 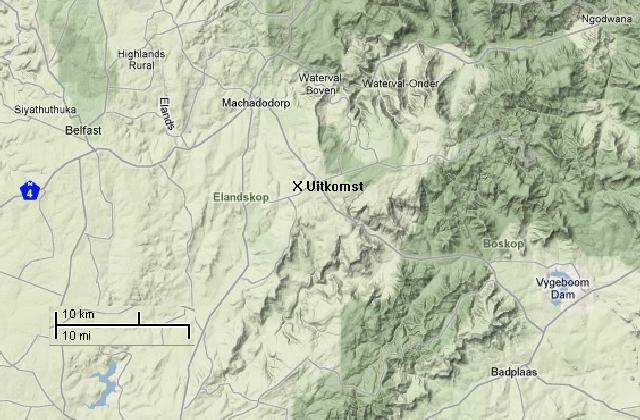 Terrain map of Uitkomst near Zevenfontein in the Belfast region. AEC Coulter (25) and B Duckering (27). Arthur Ernest [Cody] COULTER, (born Sydney 1876, died Newcastle 1958). 1445 Sergeant Arthur Ernest COULTER, "C" Squadron, 3rd NSW Mounted Rifles. 72 Private Arthur Ernest Cody COULTER, Machine Gun Section, 1st Australian Light Horse Regiment. 1498 Trooper Bertie DUCKERING, "C" Squadron, 3rd NSW Mounted Rifles. 6141 Private Bertie DUCKERING, "B" Company, 3rd Infantry Battalion. Killed in Action, Belgium, 25 October 1917. This account illustrates the imperative to check sources of information. The example given here demonstrates the reliability of information produced contemporaneously. If it was difficult to get it correct at the time, it is so much more difficult today.